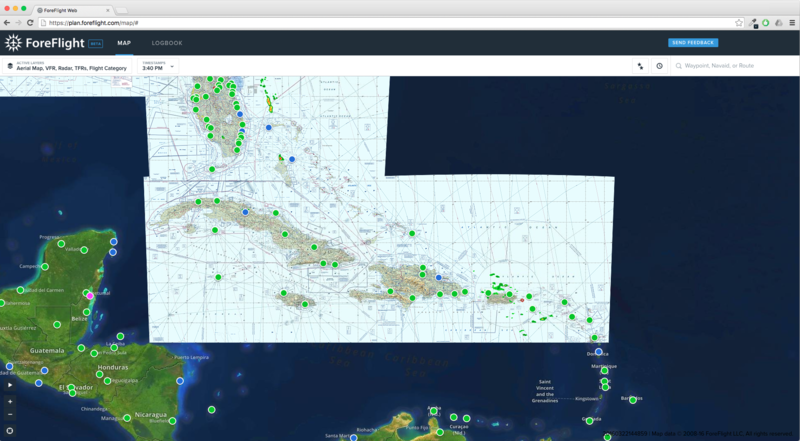 We recently added several World Aeronautical Charts (WACs) to the VFR map layer on ForeFlight Web, increasing chart coverage to include the Caribbean. The CJ-26, CJ-27, and parts of CH-25 WACs now provide chart coverage beyond the VFR Sectionals. Don’t forget that the FAA will be replacing WACs with VFR Sectionals over the next year (see our blog post from January for details). The WACs covering the Caribbean will expire in February and March of 2017, however the new VFR Sectionals for that area will be introduced before the expiration dates, ensuring continuous VFR chart coverage. This entry was posted in ForeFlight Mobile and tagged FAA, ForeFlight Web, WACs by ForeFlight. Bookmark the permalink.